There’s a viral video on YouTube of a blind man with a sign asking for change. A few people give him change as they pass by. A woman walks up, flips his sign over and writes on it before she walks off. Soon after, everyone walking by starts to give money. When the lady returns, he asks her what she wrote. She replied, “I wrote the same, but different words.” A message then pops up and says, “Change your words. Change your world.” It’s a great message of just how powerful words are. If you’re like me, you grew up singing, “Sticks and stones may break my bones, but words will never hurt me.” I think back on that saying and wonder why that lie exists. Words often hurt worse than sticks or stones and they cut a lot deeper. The words you and I speak can be used for good or bad. Proverbs 18:21 says, “What you say can preserve life or destroy it; so you must accept the consequences of your words. (GNB)” We hold the power of life and death in our words. As believers, we must be cognizant of the words we use. While according to James 3:8, no man can tame the tongue, we can be more purposeful in the words we choose to use. Proverbs 12:14 says, “Wise words bring many benefits.” The opposite is true as well. Poorly chosen words bring problems. There’s not one of who can’t attest to that. We’ve all used the wrong words at one time or another and have had to live with the consequences. Personally. I’d rather live with benefits than consequences. When we use our words to bring life and benefits, we change our world and the world of those around us. In the video, the words she used changed how others saw a blind man. How will your words change how others see that person at work, at the park, at your kids game or at church? You may never know how much your words can affect someone else’s life because even if that person never hears you, others do. Their actions toward that person based on your words can make that change. What words will you choose today? How can you change the invisible sign that others are holding up? Everyone wants to feel important and the words you say can go a long way to helping someone who is down and feeling insignificant. Find one person today that you can change their sign by the words you use. Find one person who you can use wise words with to bring benefits and life. When you do, you won’t just change their world, you’ll change yours too. If you’d like to watch that video, you can click here. On January 5, 2014, a twelve year old girl died from complications with pneumonia. As her devastated parents went through her belongings, they found she had written several letters to friends. In those letters, she had written one to herself. 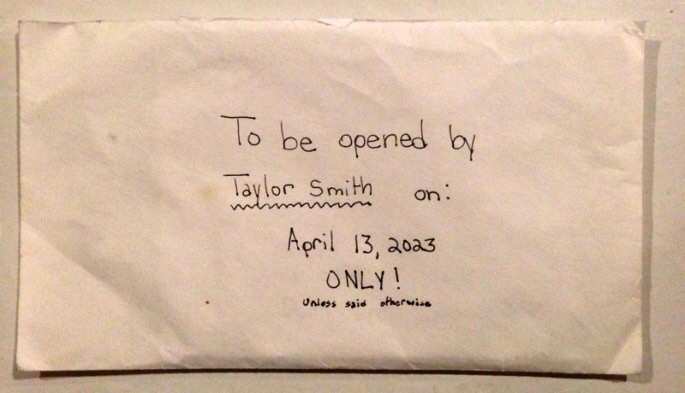 The envelope said, “To be opened by Taylor Smith on: April 13, 2023 ONLY!” They opened it and shared it with others. I won’t tell you everything it said, but if you’d like to read it all, I’ll post a link at the bottom of this devotion. She finished the letter with, “But remember, it’s been 10 years since I wrote this. Stuff has happened, good and bad. That’s just how life works, and you have to go with it.” I was moved by the whole letter, but these parts in particular. Her words to herself were meant to be read in private, but I’m glad they’re in the open now. Who knows what her life might have been like? She didn’t know, but she knew that life had it’s ups and it’s downs and that she would face them. She also knew what was most important in life: a relationship with God. Words are powerful. We have so many opportunities to speak life into others. We can build them up by just offering a few words of kindness and encouragement. You never know what someone else is truly facing and how impactful your words can be. Proverbs 25:11 says, “The right word at the right time is like a custom made piece of jewelry.” One version says they’re like “apples of gold in settings of silver.” They’re beautiful. They’re life changing. You have the ability and opportunity to speak into your own life or of others each day. Let the words you choose be the right ones. The link to the full letter is here.